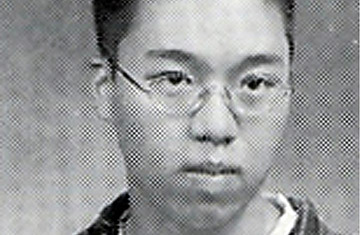 The man who murdered at least 30 people at Virginia Tech and wounded at least 14 others in the nation's worst shooting massacre was a 23-year-old South Korean named Cho Seung-Hui. Cho, an English major, had likely planned his attack for weeks and had written two bizarre plays in which boys accuse authority figures of graphic molestation. Tuesday morning the Virginia Tech police chief, Wendell Flinchum, held out the possibility that a second shooter might have been involved. He said authorities could not definitively say that Cho killed a man and a woman in a dorm earlier Monday morning in addition to the 30 slaughtered in a classroom building called Norris Hall. But Cho's fingerprints were found on a gun used in both buildings. Cho fatally shot himself  badly disfiguring his face  before police could engage him, but officials were able to identify him hours later from the fingerprints in his immigration documents, according to ABC News. Cho was born in South Korea on Jan. 18, 1984, and arrived in Detroit when he was eight. A legal resident of the U.S. whose green card was last renewed in 2003, he mostly grew up outside Washington in Centreville, Va., where his family has a dry-cleaning business and lives in a two-story, cream-colored townhouse with two vegetable patches in the back. Cho graduated from Westfield High in nearby Chantilly in 2003; his sister graduated from Princeton in 2004. A neighbor of the Chos, retired stockbroker Marshall Main, told TIME that six police cars pulled up to their house Monday night and spent 90 minutes inside. Main says he didn't see police remove anything. An AOL employee who says he is a former classmate of Cho's provided AOL News with copies of two plays Cho wrote. They are achingly bad, the writings of a troubled young man; they suggest that Cho may have been sexually abused. In both plays, a schoolboy named John says he has been molested  in one case by his stepfather and, in a play Cho titled Mr. Brownstone, by the eponymous teacher. The John character in both plays repeatedly wishes his tormentor dead, although the molester in the play Richard McBeef kills John with his bare hands in the end. Cho had recently developed an interest in firearms. According to a Roanoke, Va., news site, a police affidavit says Cho possessed Walther P22 and Glock 9 mm handguns  both expensive, accurate guns favored by gun enthusiasts and cops. One federal source told TIME it appears that as many as "a couple of hundred" rounds were fired during the rampage. Cho's extraordinary killing effectiveness suggests someone who was trained, or who trained himself, in "execution-style" killing, according to the federal source. Cho legally purchased his first gun, the 9 mm, along with a box of 50 bullets about five weeks ago from a local gun shop, according to the Roanoke Times. The Walther was purchased just last week. Virginia law prohibits buying more than one handgun in a 30-day period. It appears Cho waited the full month before buying the Walther, suggesting he didn't just snap. An affidavit state police filed to search Cho's dorm room (2121 Harper Hall) suggests Cho had been planning mayhem for some time. It says that a note containing a bomb threat was found near his body; the note is similar to two other bomb threats issued against engineering buildings at the school last week. Cho may have probed the campus emergency response with the previous notes. The affidavit said he is believed to have possessed "multiple guns including but not limited to" the Walther and the Glock. Investigators are still looking for Cho's motives, but Cho left a discursive note in his dorm room that offered some explanations. The only full quote released so far is this cryptic line: "You caused me to do this. "But the note also assails "rich kids," "debauchery" and "deceitful charlatans" on campus. Professor Carolyn Rude, chairwoman of the university's English department, told the AP that "there was some concern about him." She said his writing was disturbing enough that Cho had been referred to the university counseling service, but she said she didn't know what the outcome was. Lucinda Roy, who taught Cho in 2005, told CNN she was so concerned that she pulled him out of class for one-on-one tutoring and "repeatedly" contacted the campus police and other university authorities about him. But because there were no explicit threats in his writing, nothing could be done. During the shootings, students and university employees dodged bullets and huddled together. Tom Murphy, a 19-year-old freshman, was locked in a Robinson Hall classroom from 9:30 a.m. to 1:30 p.m. He and the 11 students, some strangers, held hands and prayed on bended knee. Like many others, Murphy had a cell phone, but the lines were jammed, and he couldn't get through. State Police said the victims in Norris Hall were found in four classrooms and a stairwell. Cho's corpse was found in one of those classrooms. On Tuesday, President Bush and the First Lady attended a convocation in memory of the lost that was remarkably lively. Those in attendance gave university president Charles Steger an extended round of applause; Steger has come under fire for the university's decision not to do more to warn students early Monday that two students had been killed. Bush kept his remarks brief: "They were simply in the wrong place at the wrong time," he said of the dead. After the service, Virginia Governor Tim Kaine announced that he is appointing an independent panel to review the authorities' handling of the massacre, to look at how police and university officials responded to the shootings and whether they had missed earlier warning signs that Cho was troubled. Meanwhile, the shootings had a ripple effect on campuses across the U.S. Universities and schools in at least 10 states were forced to lock down or evacuate on Tuesday, some after discoveries of notes that alluded to the shootings and threatened worse violence and others after reports of suspicious activity. On Tuesday evening, thousands of Virginia Tech students and supporters gathered in a field for a candlelight vigil as universities around the country held their own memorial services. with reporting by Elaine Shannon, Michael Duffy, Tracy Samantha Schmidt and Caitlin Sullivan/Blacksburg, Va. and Adam Zagorin/Centreville.